Today we are interviewing Trevor Halloway, author of the action/adventure novel "Ashes and Asphalt." Hi, my name is Rob...but I write as Trevor Halloway because my real name is rather common. On occasion, I homebrew, raise three dogs and two cats, hate people who take up two parking spaces, love Gravity Falls, and I'm the only person to have a video project banned at my community college and STILL get an A.
Mike and Kyle Byrne have to bring their dad to the annual Sturgis Bike Rally. There's only two problems: he's dead and they can't stand one another. The brothers are forced to work together and bring "Wild" Bill's ashes from Florida to South Dakota in five days. Along the way, they'll face obstacles, not the least of which is their hardheadedness. People who have their own issues with family (at varying degrees, natch), bikers, and anyone that likes a little gallows humor in their stories. What inspired you to write about two brothers who go an adventure in attempt to fulfill their father’s last wish? Part of it comes from my own connections with my brothers. I wish I could say that we did a lot together, but circumstances had kept us apart. I get along with them well, but it could've been far better. In a way, the book has been cathartic for me. Tell us a bit about the book’s protagonists. Mike and Kyle are near polar opposites. Mike's the family man who left Florida and got a 9 to 5 job. He's the responsible brother and tries to steer things in the direction that he thinks is best. Kyle's more of a carefree spirit. He still lives in Florida and followed their father's footsteps much closer than Mike. He believes that his father would've wanted a much grander road trip than what his brother suggested. In truth, both brothers did (and do) love their dad and are willing to put aside their issues to honor the old man's wishes. 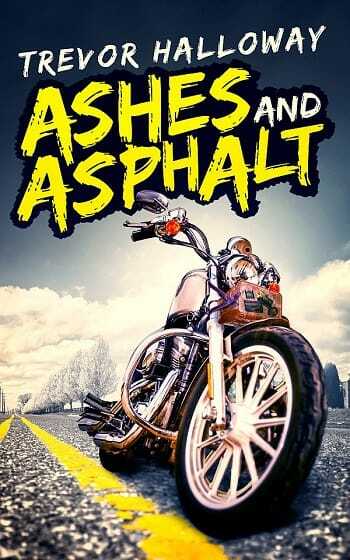 There are a lot of actions scenes in the book, from run-ins with bikers and carjackers to avoiding the police. Was there an action scene that was particularly fun for your to write? Humor is a big part of this book. Has humor always been a part of your writing or is this something that has developed recently? It's always been there, but not honed until the last couple of years. People would tell me that my stories were funny...especially when I didn't try. I figured...why not go with it? The book takes place in a variety of locations, from Florida to South Dakota. What made you decide to set the story in these locations? South Dakota is where the bike rally is held, so I had to stay true to that. Florida was a good starting state. I couldn't have them ride from Minnesota to there...that would be a novella at the most! Oddly enough, horror writer Brian Lumley. Besides him, Terry Pratchett. I got some of my humor from him. The biggest influence would be my friend, Walt Bucklin. He was my friend Jason's dad, and later my own. Ivan. He's a minor character that follows along the same path as the brothers and is put in truly horrible situations. He's like the gravediggers in Hamlet; mainly a comic relief, but that doesn't mean his own tribulations are of no consequence. If it gets more people reading...I'm all for it. Knock out a few more novels, maybe a short story or two. Then I could pull an Arthur Rimbaud. Editing. It's a pain, but it must be done if you want to be taken seriously. My tip: hire an editor. Many times. A beer sometimes helps me relax and then the thoughts come pouring in. I don't recommend that option to recovering alcoholics or persons under 21. Varies. I used to write it out, then go on the computer. I now go straight to the keyboard. I hate answering this question because there's a small part of me that fears someone will run with my idea, but I do have an idea about a stripper turned detective. Believe it or not, I'm trying to keep it under NC-17. If Stan Lee could do it, so can I.